This is a replacement breakout cable for the Presonus FireBox. 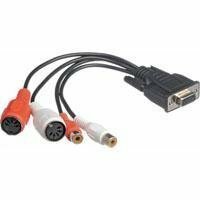 The cable's multi-pin DB-9 connector attaches to the rear of the FireBox and provides input and output of S/PDIF and MIDI. It can be used to attach the S/PDIF output of an instrument or device, and it can transmit 24-bit 96 kHz digital audio signals. The MIDI ports can be used for communication with external MIDI equipment, MIDI programming, MIDI machine control, and MIDI time control.